In November 2016, the Anishinaabe artist Jim Denomie was following the news closely. Thousands of indigenous and environmental activists had gathered in North Dakota to protest the construction of the Dakota Access pipeline. 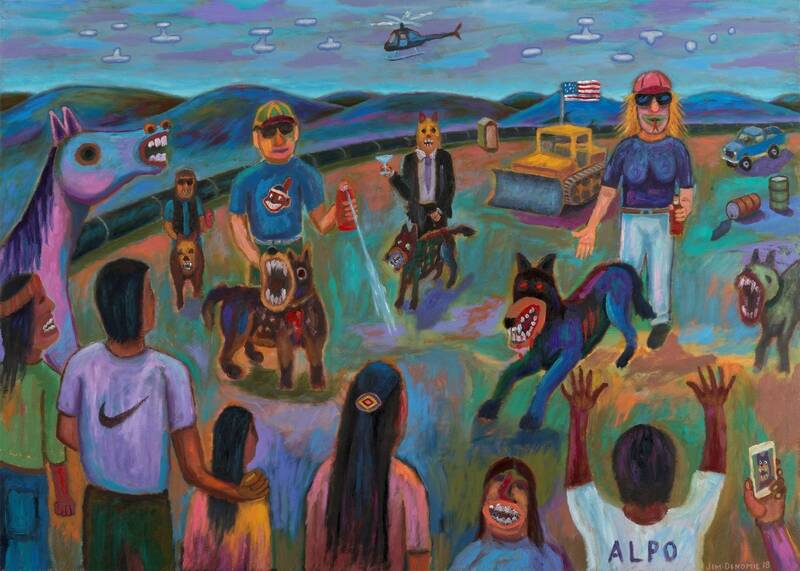 "I have a history of painting about history," he said recently. "And I saw this as history in the making." The protestors were concerned in particular with a section of the pipeline that would run under the Missouri River, potentially threatening the primary water source for the Standing Rock Sioux Reservation. Local authorities brought in tear gas and water cannons, while private security guards threatened protestors with attack dogs. To Denomie the situation at Standing Rock looked in many ways like a military battle, and it called to mind the 1890 massacre at Wounded Knee. "It was a similar event," he recalled. "The same elements were there for a tragedy to happen." 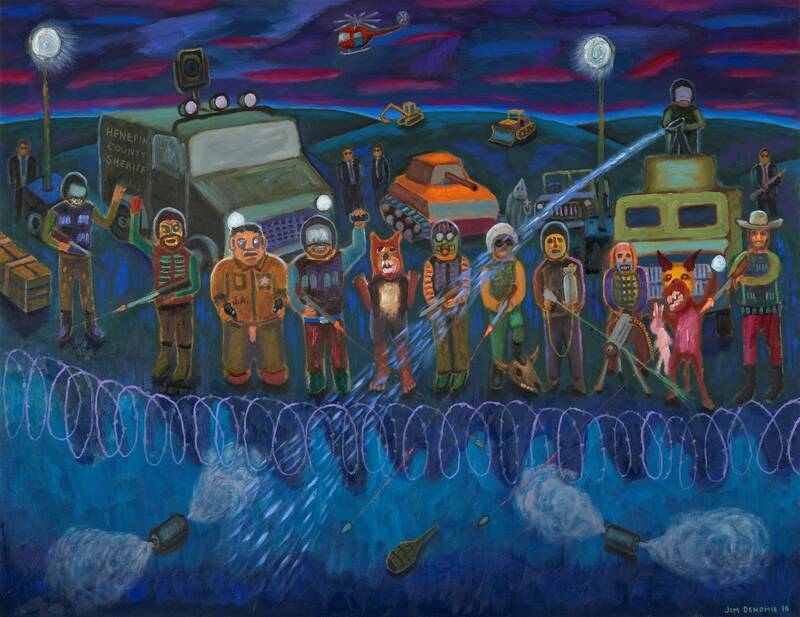 A new exhibition of Denomie's paintings, done in response to the protests at Standing Rock, opens Friday at Bockley Gallery in Minneapolis. The show's signature piece stands almost 8 feet tall and 10 feet wide. The Missouri River glows Technicolor orange and pink. The attack dogs have been given two heads — an allusion to Cerberus, the dog in Greek mythology that guards the gates of Hades. President Trump is seen groping Lady Justice, while former President Barack Obama is portrayed as a sitting duck. Men in suits clink martini glasses and smoke cigars. Brightly colored frogs emerge from the river, and what appear to be spirit creatures float in the sky above. It's as though both the natural and spiritual worlds are joining the protestors in the fight to protect the land. Denomie says while he makes sketches of his work before he begins to paint, a lot happens on the canvas. "I've learned over my experience making paintings especially about important events that I receive information from the spirit world," he said. "It comes to me from somewhere, I don't know exactly where — but I often come away from these paintings with a better understanding of the story or the events." Paintings curator Robert Cozzolino from the Minneapolis Institute of Art said Denomie "is doing some of the most amazing narrative paintings that anybody's doing in the United States right now." "Jim is a storyteller and he is interested in looking at the politics and social developments in cultural movements of today and always thinking about how they aren't just springing out of nowhere but have the weight of history behind them," he said. Cozzolino said Denomie uses his biting wit to make keen observations on the persistence of historical trauma in contemporary culture. 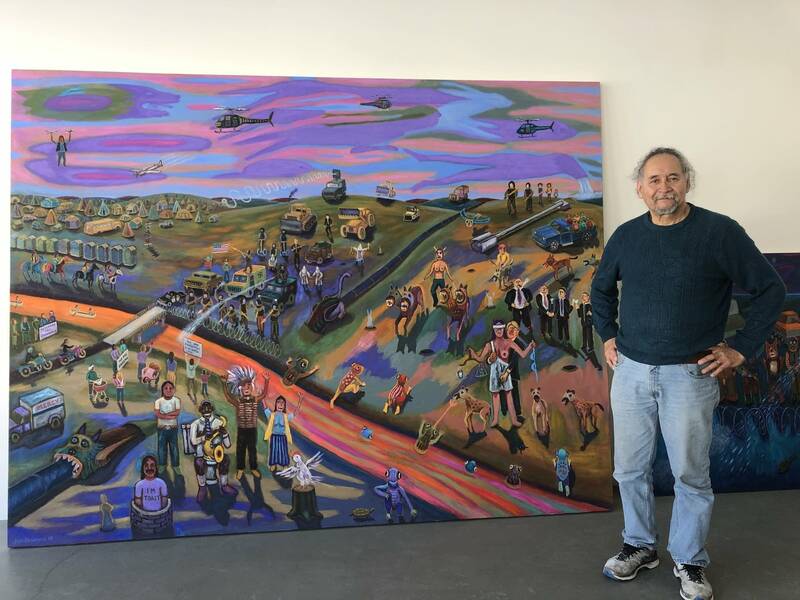 He finds Denomie's "Standing Rock 2016" painting reminiscent of Pieter Breugel the Elder's classic work, "The Triumph of Death." 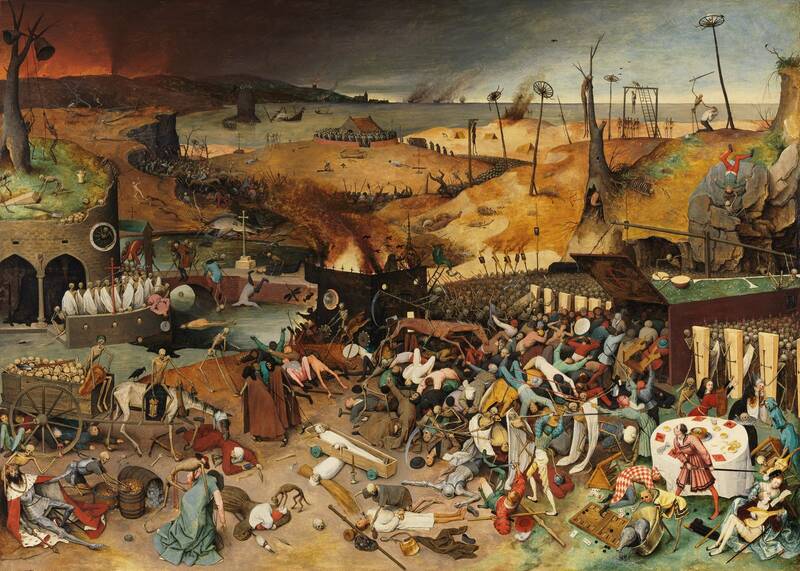 In Breugel's 16th century painting, skeletons lay waste to a town indiscriminately. "There's this tradition of making a picture that seems surreal and absurd and full of horrors," he said. "And the viewer might initially think what they're looking at is a fantasy. But the more they look at what's depicted and scrutinize that depicted landscape, they begin to realize it's their own world." 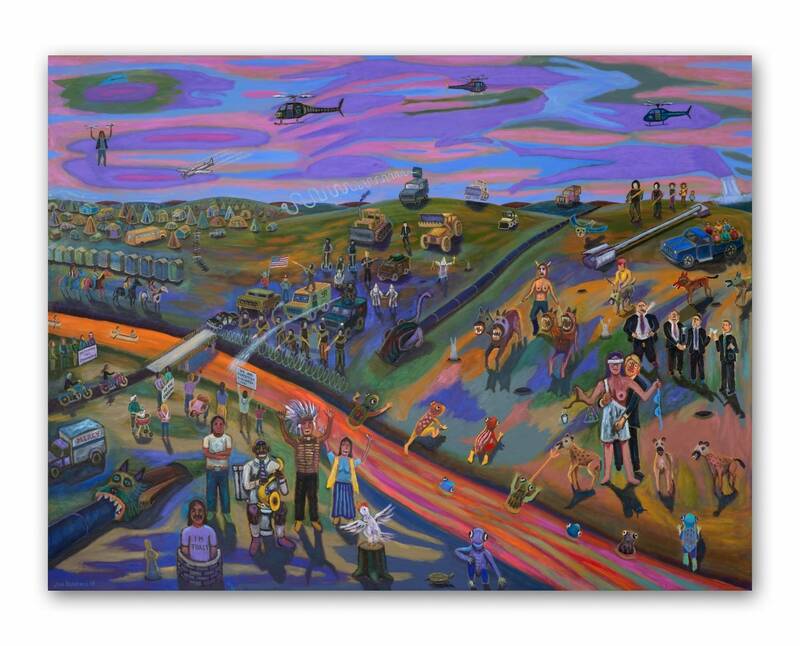 Jim Denomie's exhibition of Standing Rock paintings opens Friday night and runs through April 6 at Bockley Gallery in Minneapolis. Denomie will give an artist's talk on March 7.